Kiana – Available for Adoption! Likes: She sleeps in the kennel and likes to! She is a sweet puppy.. She isn’t small or big.. 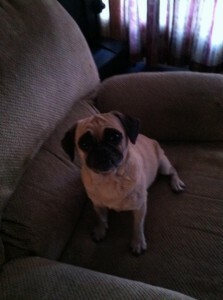 I would say she is about 15ish lbs so pretty much standard for a pug. She doesn’t snore. . She is house trained which is good. She is a runner. My kids left the front door open and she got out so we had to catch her. We did catch her right away but fenced yard is probably important with her. She likes the kennel. I have never put her in.. she just goes in and sleeps in there so she must’ve used one before. Great with my kids, lots of energy. Seems very healthy. She does fine with my dogs.